Lexus has partnered with Time Out for its self-charging CT hybrid model to highlight how it is the perfect car for 'busy urbanites'. The "Say yes to the city" campaign in the UK is an editorially-led and content will attempt to inspire people to make the most of their city. The & Partnership’s creative agency CHI & Partners and media agency M/SIX partnered with Time Out’s creative solutions team for the campaign, led by the partnerships team at M/SIX. 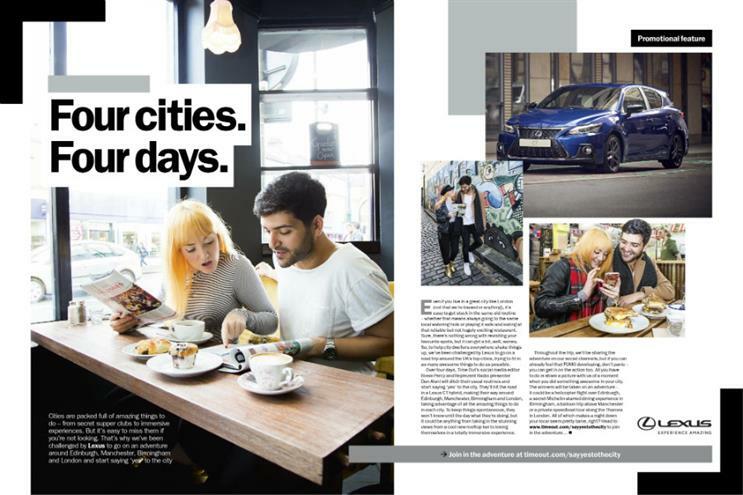 As part of the campaign, Time Out’s social media editor Rosie Percy and her partner, radio presenter Dan Alani, attempting to pack in as many of Time Out’s recommended activities as possible in four UK cities in four days, while relying on the Lexus CT Hybrid to get around. The couple will visit Edinburgh, Manchester, Birmingham and London during the campaign. Lisa Fielden, manager of brand communications at Lexus UK, said: "This is a gateway model for the Lexus brand, and the perfect car for busy city-dwellers and sightseers with packed social calendars, who want to miss out on nothing." Sponsored content will document the challenge through a co-branded digital and social video series, which will be supported by live updates across Time Out’s regional city social pages. Between them the Facebook, Instagram and Twitter accounts have a total of 3.2 million followers. Content will also feature on the website and advertorial features in the print magazine. The London challenge kicks off on 24 October and the activity will be signposted print readers via a cover wrap on that day’s magazine. Pan-European activity will include a TV ad, and digital, social print, and out-of-home ativtiy. The 45-second TV spot, directed by Jovan at Stink, takes viewers on a fast-paced journey through an impromptu night out after work.